The Duchess of Cambridge made a pit stop at a McDonald's situated at a roadside station en route to Kensington Palace from Anglesey, accompanied by Prince George and Prince William's former nanny, Jessie Webb. There were reports in the media suggesting the Cambridges had hired 71-year-old Ms. Webb to look after little George which were obviously spot on. William and Harry obviously had a very positive experience with her and feel she's the perfect choice for the role. Many of you will recognise Kate's ensemble. The Duchess sported pieces we've recently seen her wear at the Ring O' Fire Race Start and a Waitrose shopping trip. Kate elected to wear her Ralph Lauren hacking jacket with a plain white t-shirt underneath - possibly a Zara piece. The Duchess teamed the pieces with her Paige Denim 'Skyline' Skinny Jeans. The stretch denim is shaped into a sleek, skinny-leg style finished with a tapered, ankle-length hem. They're available for €125 in sizes 24-32 at Nordstrom. 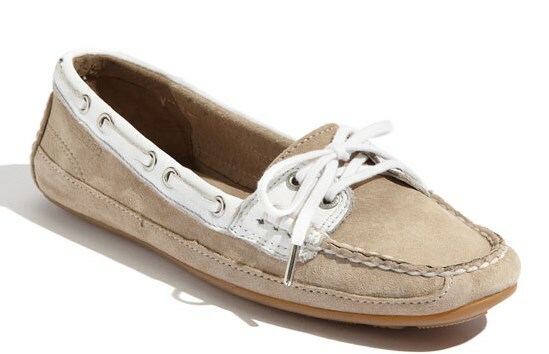 Kate also wore her comfy taupe and white Sebago 'Bala' Boat Shoes. According to various reports, it is William's final week at RAF Valley, meaning Kate and George have quite possibly left the isle for good. Prince William has engagements throughout the week (more to come on that shortly) so I expect he shall be joining them tomorrow. I was away from my computer quite a bit over the weekend and my oh my, what a strange week it has been for royal news. There was a break in at Buckingham Palace, in which Prince Andrew was mistaken for an intruder and was ordered to lie on the ground before he identified himself. Andrew's team released a very understanding apology, but the rumour that everyone is talking about says the Prince is absolutely livid. There's been quite a few filler stories (when it's a particularly quiet week for news, journalists get rather imaginative) about Kate too. 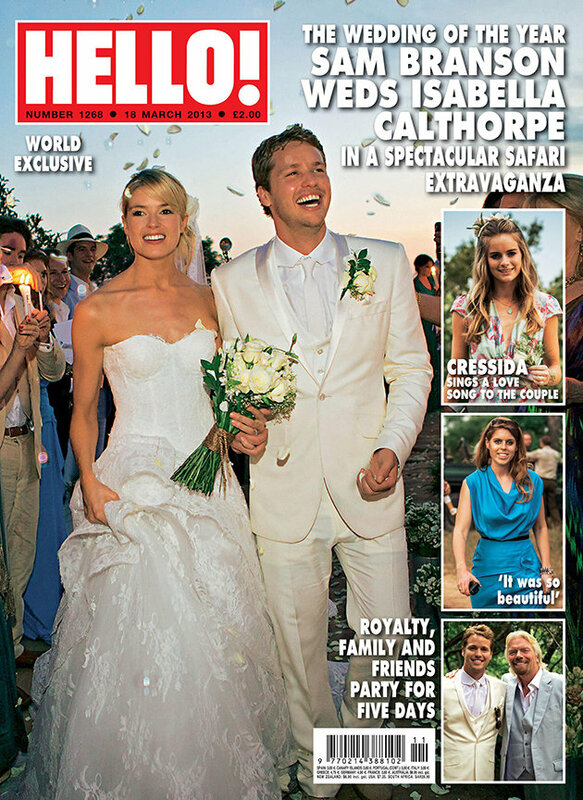 It has been claimed the Duchess does not want Harry to marry Cressida Bonas because William pursued her half-sister Isabella Calthorpe, who is now married to Sam Branson, many moons ago. Kate is friends with Sam's sister Holly Branson and knows their father Sir Richard Branson very well, so I very much doubt there is any truth to it. On Thursday, the Duke and Duchess will attend the first annual Tusk Conservation Awards. The Awards, developed by Tusk Trust in partnership with Investec Asset Management, aim to recognise and celebrate outstanding achievement in the field of African conservation. William and Kate will meet the finalists at a private reception before the awards. The glitzy event will be held at The Royal Society in London. The occasion calls for a full length gown, so perhaps the Duchess will opt for a sparkling number as she did for the ARK Gala in 2011, when she selected a shimmering rose Jenny Packham gown. To coincide with the awards, a sixty minute documentary featuring an exclusive interview with Prince William showcasing the Tusk Trust's work is due to be broadcast on CNN and ITV on September 15. Yesterday, CNN shared William's words on Africa. On Saturday, September 14, William and Kate are expected to attend the wedding of their close friends James Meade and Laura Marsham at Gayton in Norfolk. Tomorrow William and Harry will attend the BGC Partners Charity Day in London. The annual events commemorates the NYC-based company's 658 employees who lost their lives in the 9/11 attacks. No doubt the anniversary will be marked all over the world and it's an important day of remembrance in the US. Meanwhile, William, Harry and Charles will attend the funeral of one of Prince Charles's closest friends, Hugh Van Cutsem this week. Kate is not expected to attend. Finally, a painting by a talented British artist with Down's Syndrome is getting pride of place in Prince George's nursery. 43-year-old Tazia Fawley donated the brightly coloured work to William and Kate, as a personal gift to mark the arrival of George. To Tazia'a joy they accepted the painting of hot air balloons over Bristol's famous Clifton Suspension Bridge and children's favourite Rupert the Bear, and sent their best wishes to her. Wasn't that terrible for Prince Andrew? It must have been terrifying in the first seconds, and I wouldn't blame him one bit for being livid in later reaction. However, it's big of him to issue the statement he did. I'm sure the diners at the McDonald's were tickled to see Kate. Maybe she's getting the new apartment ready for a big welcome-home party for William? One likes to speculate . 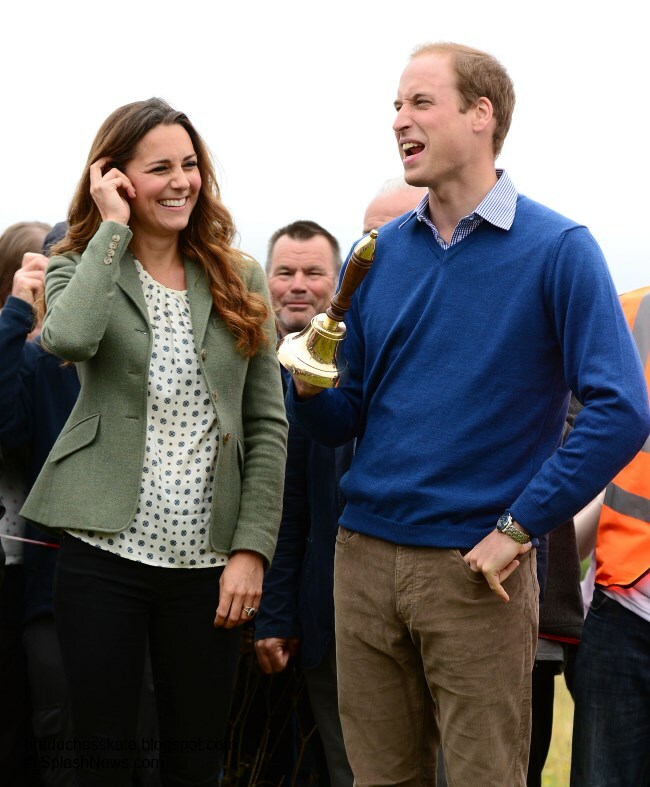 . .
And won't it be fun to see her and William in fancy dress again! Thanks, Charlotte, for this fun post. It was a terrible incident and somewhat worrying that security isn't quite tight enough. Looks like it's time for a review of security at the Palace. I've been looking forward to seeing Kate somewhere again :) And I am looking forward to seeing all three of them too, especially Prince George :) Do you have any ideas when could that be? And I must agree with you Charlotte, I don't think there is much truth to those stories going around this weekend about Kate not wanting Harry to marry his girlfriend. The media just wanted to have something new to write about as this is rather a silly season at the moment. They cannot know whether Harry really IS going to propose or NOT. It is just another of these defamatory articles. Once again, Charlotte, I'd like to thank you so much for making the time to keep us all informed. You're doing an excellent job here. Thank you! Surely they won't take him to the wedding. All eyes would b on him and not the bride, it's her day after all. I am sure if they take him to the wedding he will be out of site. YOu will never know he is there. But you have to remember she is still breastfeeding. So she can not be away from him to long. I hope they do take him along with a nanny. Kate will make sure he does not take the thunder away from the bride. Thanks for the post Charlotte. Loved the way Catherine had done her hair. Unexpected to find her in McDonalds, but seem to remember Diana taking the boys there. Yes I love her hair up so chic. Whenever I do mine loose they fall out!! Kate's must be heavy too. Wonder how it done? Maybe it was just turned around and you could not see it. That has happened before. It look's just like she has her weddign band on. Hi, I think that she just don´t use this ring much when she is not on offical occasion - let´s face it, it is not the most practical ring :-) especially for driving and taking care about a baby. And Kate is definitelly not the person for a "blink ring" IMO. This ring is very special because it is Diana´s ring but it is too big, too heavy and too expensive to be worn at home etc. I have much smaller ring and a wedding band and I put them off when I´m at home..maybe Kate feels the same. I´m looking forward to tommorow and I also bet she will worn something repeated but with some refreshing change, I doubt she had a time to had some bespoke piece maden. Or perhaps something she had prepared for winter events and finally couldn´t attend due to her sickness then?Like what she had for those "Winter whites"...which I think was her Mc Quenn white from Malaysia state dinner but with another/ or none top layer. Hi Mia- If you ever take a good look when Kate is out and about she alwyas she both rings on. There is not one time that I hve nto seen the rings off. But now that she has a baby she might take the engagement ring off when she is dealing with the baby. @Siddhii Send me an e mail at pmsockser@aol.com. There is just a few of us who have become really good friends that have like to keep in touch. oh gawd I hope the press doesnt notice that because if they do we will have to endure countless "trouble in paradise" nonsense. Oh gawd I hope the press doesn't notice that because then we will be bombarded with "trouble in paradise - duchess without her ring" rubbish. I can't wait to see Kate in a gown for this Tusk event. I doubt there is a chance of a tiara, but one can hope. She is looking really great. I just adored that rose pink Jenny Packham gown, and her hair and make up too. It was her best evening look for me. It was her best look full of promise. Her hair was amazing that day, Shame she has changed it so much. How nice to check in and see another great post. I was really surprised to see Kate at a McDonalds but you did not see her carrying a bag of food so maybe it was just a pit stop. I really do hope they get this security thing figured out at teh Palace before William & Kate move in. I know they are not at the Palace but it is really close to KP. I surely bet William will have the security around Kate & George checked out. He wouild not want this to happen to them. I feel sorry for Andrew. Wondering where the security team was. I can not wait until Thursday to see our beautiful Kate & William together again. I hope she wears something new and her hair up. But no matter what she wears or how her hari is she is always just so beautiful. Thanks again Ms. Charlotte for this great blog. HOpe you can join us one of these days on our chat. We miss you. Thank you so much, I would love to participate more and most definitely will as time allows. The Times obit. for Hugh Van Custem has the funeral for Sept 11 at 11am not Fri Sept 13. Kate looks lovely! But I don't like when her hair is that light. I think she looks prettier with darker hair, her natural color. But if she is feeling great about it, then so am I! I have a feeling she'll recycle a dress for thursday's event and for the wedding! That would be great because her dresses are always to die for, no matter if they're new or old! And about Prince Andrew's problem, no wonder why he's livid. I guess most of us would be! See ya thursday! Can't wait! And Charlotte, Thank you for this post! You're the best! Dear Charlotte thanks for all the great info! I am glad she is down to earth enough to venture into McDonald's we all need it sometimes even the royals! That is sweet what William says about Diana I love how he continually honors her in public. I can't wait to watch that CNN special on the 15th. I am so looking forward to seeing Kate tomorrow at the gala ! I am sure she will be radiant and glowing it will be so nice to see her in a formal gown again. I know she won't wear a tiara but I hope we shall see her in one soon. I am also hoping we shall see some good photos at their friends wedding. I highly doubt Kate wouldn't want harry to marry Cressida but I also doubt that harry wants to marry her or anyone right now lol. Its terrible people keep breaking into the palace. You think security would do more after how Her Majesty woke up to a man on her bed! I think it is pretty disgusting they did that to Prince Andrew I would be pretty livid too! I mean who doesn't know him? Especially the security around the palace? Seems strange. I forgot to say the painting by that girl is absolutely lovely! Anyone would be proud to hang it in their nursery so glad Kate and Wills chose to! :) thanks again Charlotte for the info. Nice to see they hired former William's nanny: it's a sort of grandmother, don't you think so? Little George is in safe hands. Didn't take them long to get a nanny! So much for hands on and carole helping. Feel quite sorry for a 71 year old to be looking after a newborn. Seeing my mum just playing with my children let alone doing the day to day stuff is quite hard for a person of that age. Kate is not wearing her engagement ring but no big surprise there. Diana mostly didn't wear it when she was with William when he was young. The ring is large and easy for a baby to get scratched or bumped with, or to grab onto. Also tough when you're washing your hands often. We'll no doubt see it return on engagements. Does anyone know where the stories about the Cambridges NOT hiring a nanny came from? Even when those stories were circulating I didn't believe them, it seemed really odd that a couple with their responsibilities and duties wouldn't have a nanny. But, now that they clearly DO have a nanny, I bet there will be a backlash and suspicions of any stories that try to portray an image of the Cambridges as an ordinary, down-to-earth middle-class family. Personally, I don't care if the Duke and Duchess have an entire army of cooks and housekeepers and nannies and drivers, they're incredibly privileged people and Kate doing her own grocery shopping once in a while doesn't mean that "they're just like us." Charlotte, thanks for the lovely post! It's always such a nice surprise to see a "surprise" appearance by Kate! I will say she looked great! I LOVED her hair pulled back! I'm sure everyone inside was quite shocked to see her stroll through! As for all the other Royal news.... I think alot of it is just rubbish. It seems like some of the writer's are desperately searching for anything they can make up about William and Kate during this quiet time. You would think they could find something better and more constructive to do with their time, but I guess there are those that will buy the papers and believe what is written. I'm sure there will be a review of security after the Andrew blunder. I was surprised to read about it. You would think this day security would be at its tightest and they would be on top of things, especially at BP. I know the Queen is not currently in residence, but still. Quite frustrating and embarrassing for the Palace. I'm sure Andrew was NOT happy. Very much looking forward to the Tusk Conservation dinner at the Dorchester Hotel. The Dorchester is beautiful! It's not too far from KP, so I wonder if Grandma Carole will be with Little George? Excited to see what Kate will wear. I know she will look beautiful! Such a fantastic cause to support and we all know one very dear to William. It should be a fabulous night! Thanks again for all the updates! Charlotte, hope your week is going well! While I don't think there is anything wrong with hiring a nanny, it just seems to me that there is always a lot of secrecy around this couple that you do not really see with other royal couples. They are entitled to their privacy, but let's face it they are the next King and Queen of the UK. I'm still surprised that they have not released any new pictures of the baby as he is almost 2 months old, and his christening is not until next month sometime. I saw on line the other day, beautiful pics of Princess Victoria of Denmark with her daughter when she was about 1 month or so and I thought it was really refreshing to see a public person so happy to show her baby off with lovely pictures. I truly believe that the more the Cambridge's keep things secret, the more it will eventually backfire on them. Well said. Exactly my thoughts. I have always thought this they want the best of both worlds. I always remember the run up to their wedding the public went party to any of the details like we had had with Charles n diana , Andrew and sarah. It's not being nosey or prying it was bring interested in the heir to the throne, I didn't think they deserved all the thousands of people that turned out to celebrate and wouldn't it have been funny if it had all back fired and no one turned up to cheer them etc. the same should be said now with their engagements why should we bother turning out and supporting them. The public will get tired of this and support could dwindle. What would happen then to them they truly would have up be ordinary. Why does every one have to put down William & Catherine for wanting a private life. And I guess nobody paid attendtion to what William had to say during part of the CNN interview where he stated that he know's his postion within the royal family and what his duties are. But he will does things is way when he can and do things the royal way when he has to. So why is that not ok with you people from the the United States. There is no way that just becasue they are doing things their way that they will ever be just common people. And people will always love them no matter what they do. I live in London and I can speak that they are the breathof fresh air to the royal family and the people of the UK just love them. They will not be the next King and Queen---Charles is the heir to his mother and then William. I don't think they ever said they would not have a nanny at all---just that in the first weeks they would not have a maternity nurse. At the time the baby was born they could not have had a nanny---no room at their cottage at KP, which is why they stayed with her parents. I cannot understand why you think we had no details prior to the wedding; They were reports all day and every day. As for photos of the baby---we have already had two lots. The people who celebrated the wedding or turn out to see them, do so because it gives them pleasure; there is no coercion. If you read the Court Circular occasionally, you will see that members of the family carry out a multitude of engagements never reported elsewhere. Just at the moment William and Catherine are the ones the press follow, but I have been around a long time and have seen that the press concentrate on one for a time and then move to some one else. Baby Princes and Princesses are lovely to see, but should they be so much in the limelight? Is that the best thing for a young child? I doubt it. Well the European royal families manage it nor do they bleat about the lack of privacy and there weren't many pre wedding details there were daily reports and speculation but nothing firm and yes alot if other members of the royal family are working hard on their duties but this royal couple do very few. I'm anonymous s 20.40 and I'm a Brit living in the uk. My options are also the same as many uk people. Melissa212, Prince George is only 7 weeks old and there have been the initial pictures from the hospital the day after his birth and those taken by Mr. Middleton when George was 2-3 weeks old. I could be wrong, but I don't think it's common or expected for pictures to continually be released. From what I remember with William, there was the picture released at 1 month, official christening pictures, 6 or so months at KP, and then on the Australia tour with his parents at 9 months. Jean, correct me if I am wrong. Again, he's just 7 weeks old. Are the pictures you referring to Crown Princess Victoria of Sweden with Princess Estelle? If so, those were official photos taken by a professional. William and Kate chose to have her dad take pictures in the garden. Obviously a difference, but pictures were released. I'm sure those will be coming for Prince George in the near future. William said in his recent interview with Max Foster that he and Catherine are happy to show off Baby George, but continually releasing snapshots is not going to happen. Unfortunately, I'm sure the paps will get some from somewhere in the near future also. The princes wore navy blue to the family friends funeral I would have thought it would have been protocol for wearing black? Camilla wore black. I wonder if the reason the Princes are always in blue is because their mother really liked blue suits. I don't know if you recall her funeral, but Prince Charles wore a blue suit and was criticized for it. Then he told a news organizarion that he wore it to honor Diana because blue was her favorite suit color. @ Dougies girl -- You have a great memory, and you're exactly right. There's more of an emphasis on William and Kate's privacy because of what happened to Diana. The level of interest in her, and now William and Kate, cannot be compared to other royals. They share information that needs to be made public. No more, no less. I share your frustration -- 100% -- and I promise you that this American also sees William and Kate as a breath of fresh air, just as Diana was in her day. They are a lovely young couple and wouldn't the world be a much better place if people their age and younger looked up to them, rather than some other people who make headlines that I would rather not mention. Kate is a classy young woman who was fortunate enough to meet a real prince and they fell in love. I'm happy for both of them and I wish them nothing but the best as they raise their family and represent the royal family. IMO, much of the criticism of them is a case of some folks not fully understanding just how much the royal family's past (1980's and 1990's) has influenced decisions that were made in the last decade...and will continue to do so in the future. LOL, this sir Branson is so determined to be part of the Royal family, one way or the other...just joking. I don't care for the owner of the airline that much. Aha ! Elizabeth, I believe you're right in pointing out why the nanny was seen in public with Kate and the baby. I was wondering about this and I could not make any sense of it. Especially since Kate went out of her way to stress how the baby was with "granny". But I believe that you've hit upon the truth - thank you ! Anonymous- What truth did Elizabeth hit upon? I don't think she had any truth in her comments. Just alot of hate toward Catherine. What I like in Royal Family is that they seem to be able to learn from their mistakes. The password of Queen Elizabeth has always been "duty": but when she was a young queen and a young mother, maybe this duty towards her role as a Queen overwhelmed her role as a mum, and Prince Charles payed a large amount of that. Then Lady D payed, as well, and Camilla (people often seems to forget that she was the first, not Diana, in Charle's life, and that she could not be his wife because of medieval rules about virginity). Diana (with the approval of Charles, isn't it?) had the courage to bring up their children in a different way, and now I am sure the Queen understands very well the matter, and she encourages William and Catherine to do their way. I like Queen Elizabeth for being both a rock for the tradition and a woman able to understand the changing times. A nanny, also a full time one, is in a lot of bourgeois families: what to say about? I think that the choice is very good, and also that William wants to have somebody of his strict affective links for his son. He has no more his mother, but happily he had a lovely nanny. The same who, like a half-grandmother, will take care of his son. I see in their behavior and in their choices a great coherence, they put ahead family values in everything they do. Bravi, I appreciate the model they are trying to be. Suggesting the Queen ordered them back to London is somewhat absurd, considering Prince William worked his last shift only on Tuesday and yesterday was with Prince Harry on a bank trading floor raising money for their charities-a yearly event in memory of Cantor Fitzgerald staff who died on 9/11. Both then attended a friend's funeral and in the evening Prince Harry was at another charity event with children and told one of them that Prince George had smiled at him for the first time yesterday. Charlotte- They are announcing about William! I just read that after 7 years of military service William is quitting the RAF! I feel sad for him as he loved that job and never loved his royal obligations as much which he said in interviews but I guess he is a dad now and having him home more will be good for Kate and George. I hope he will be happy with his new full time roll when the palace announces it I just hope he won't be too sad or nostalgic or even bitter about his RAF career he gave up. Charlotte. I must take this opportunity to say Thank you for all your work , research and amazing patience. You have created such a wonderful blog here and a fantastic community of Duchess Kate Fan friends. It really is fun to have friends who enjoy , support , want and hope the best for this young couple. Hope you are having fun searching for your wedding dress , veil , shoes, etc........every time I see wedding things I think of you and Bluefire.